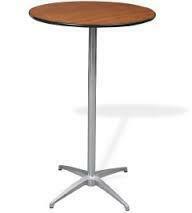 This table is 30" in diameter and 42" tall. It is about 12" higher than a standard table. The rental price does not include set-up or break-down.